Sounds like an adorable book. Thanks for brining it to our attention. I love that book! Have you read Library Lil? 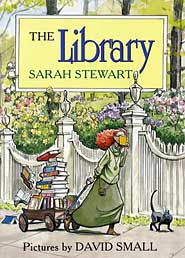 That's another of my favorite kids books about a librarian. hmmmm, dare i say this sounds like someone familiar?!? another red head we happen to know? who just got her dream job at the library?!? hurry up and start so we can live vicariously through you! btw, i start my "volunteer" job at the library this wednesday!!! i'm so excited!!! Thanks everyone for commenting on The Library. I am very excited to start my job and tell you all about it!! Even if you don't have kids, as book lovers, you all would appreciate this book so much!! O how cute! And she kind of reminds me you :) (in a good way). I love it! The Library sounds so good! I hadn't heard of it until now! Thanks for the post! OMG you changed your look, I love the colour,very unique. It's a great book and it's so apropos of you! I absolutely love this! I haven't heard of it before but I simply must find a copy to read for myself...thank you for shining the light on such a wonderful bookish read! (Ahem...fellow avid reader here...it's right after my heart.) Happy reading!